Hi everyone ! I've been browsing this forum for a while, now I decided to take the plunge and request your advices for my pixel works. So, this is my very first "serious" sprite. It's intended to be used later in a kind of 2d side-scrolling game. Maybe it's obvious or not, but I take my inspiration from AbyssWolf (http://abysswolf.deviantart.com/), mainly for character proportion and skin color. Thank you for reading If you have any comments or suggestions, post here, I need them ! I'm not a professional artist so I can't give you a real advice, but I think there is a problem with the timing of the punch.. The timing between the punch and the legs movement is unnatural.. I think she needs start moving and meanwhile start the punch itself and not after the punch. Sorry if I wasn't clear, english isn't my first language.. I have a hard time seeing what is going on with the punch.. It looks like it stops halfway and then goes into a snake-like motion. I like your sprite though, but the blues feel a bit too saturated. I also think you could simplify some areas of the clothing to put focus in the right places, since right now it's a bit hard to read. The right arm (the arm to the left) looks really off, since it's smaller than the other, it also seems to get bigger for a few frames in the punch animation. Thank you two for your comments. I will try to improve all of those points. @Seiseki : I understand what you mean with the "wavy" arm. Hmm maybe I should try to bring it closer to the body before letting it fall (hope I am understandable). The animation is way better now. 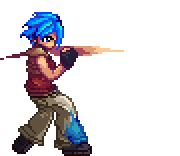 Also, I love the blue hair saturation, so I don't agree it's too much. As for some stuff to improve upon: study the cluster threads. Your sprite is a good example of way too much unnecessary shading detail, trying to hide the fact that the basic clusters just don't work. The result is a lot of what seem almost like scribbly lines everywhere. I'll try to do an edit if I remember. I think it's much better now but there is still a little delay..
Hmm I think that in order for the punch to look more powerful, you need to fix that delay. The punch should end only after the legs switching, that way the force from the leg against the floor will transfer to the punch as in giving it a "push"..
Like when you jump you use the force from the crouching to jump, it's the same here. Wow it's really hard to explain something like that in english xD Hope it's understandable.. The arm shouldn't be wavy like that. You're trying to go from an idle stance, to a punch and then back to idle again.. But within a very short time frame with no real windup. Try making the same move yourself in real life. Something else wrong with the punch animation is that the blur of the hand seems to be further back than where the hand ever begins. There should be no trail where the hand never was. Something you might want to consider is punching with the front hand instead of the back hand. This would remove the beat where you currently need to pull the back hand back. The major action frame has a higher delay than the frames around it. That means you're slowing down her fist in the middle of her punch. This should be one of your lowest delays and fastest frames. Mess around with it some more. I'm not so sure about that. The implication of the blurred frame is that some part of the body started at the left, but it's current position is at the rightmost part of the blur. Without the blur, then yes, the middle part of the motion would be quicker, but with the blur, the speed of the motion is implied. Reducing the time on that frame will apparently help, but I think that's because the frame is wrong, rather than that it should be quicker. Note the blur starts behind where the elbow started. What is it that got blurred? Note also that the implication of the blur is that the fist is already fully extended to the rightmost point of the blur, which makes the stance fairly strange. The example Seiseki provided also illustrates the other problem I mentioned before. You're starting out with the punching hand at the front. This means that your get ready involves turning away from the viewer, which adds a delay to the animation. In a game, this could make the punch feel very unresponsive. The punching hand is already further back, so there is no need for the character to turn away from the viewer to prepare for the punch. Instead, he finishes the punch turned away from the viewer, and returns to forward after completing the punch. In other words, you'd be better off punching with the other hand.